Samsung QE49Q7C review | What Hi-Fi? Never one to rest on its laurels, Samsung’s 2017 QLED TVs, are aimed at taking a direct swipe at the ever-increasing popularity of OLED screens. Premium designs, top-tech specs, picture quality that dazzles you as much as the high price tags? QLED vs OLED is the biggest grudge-match of 2017. This is our first proper look at a Samsung QLED, and we’re excited. Can the Samsung QE49Q7C live up to expectations? This Q7 set sits at the lower end of the QLED range, with the flagship Q9 and Q8 TVs preceding it. The 49in TV may not be imposing, but it packs all the latest technology – Ultra HD 4K with High Dynamic Range (HDR) – into its smart, curved design. Compared with last year’s quantum dot sets (such as the Award-winning Samsung UE65KS9000), this year’s QLED (Quantum Dot Light Emitting Diode) uses more advanced dots with a metal shell and core. Samsung claims this delivers improved brightness, colour and contrast, as well as giving better viewing angles. At their heart, QLED TVs are still LCD sets with LED backlighting. In the QE49Q7C’s case, it’s an edge-lit set. Unlike Panasonic, Sony, Philips and LG, Samsung has resisted the call of OLED, insisting that its QLED technology is at least equal, if not better. When it comes to specs, it looks impressive. The 49Q7C claims 1500 nits of peak brightness – that’s well over the Ultra HD Premium specification’s 1000-nit minimum standard for LCD TVs. The 49in Q7C set also claims to display 100 per cent colour volume (that represents the colour gamut and all shades displayed up to peak brightness), which should show off far subtler and more accurate hues than ever before. This 4K screen is also HDR-compatible, supporting the standard HDR10 format and the broadcast variant Hybrid Log Gamma (HLG). There’s no Dolby Vision HDR support as Samsung has its own rival dynamic metadata, called HDR10 Plus – which is currently supported by Amazon Video – built into the QLED sets. The Samsung 49Q7C shines with 4K HDR content. And not just literally – the picture certainly is bright and punchy, with lens flares, sunlight and lamps giving off exactly the right amount of intensity and insight needed. The vibrant shades of colours leap off the screen, too. But it’s the clarity and amount of detail within those bright and colourful moments that really impresses. The 49in screen comes to life when watching Planet Earth II on 4K Blu-ray. The plump white and pink feathered bodies of the flamingoes are so textured and packed with subtle colours that you want to reach out and touch them. The crystal clear blue sea looks stunning too. It’s mostly a smooth picture, too. There are some judder issues when confronted with slow-panning scenes, but that can be smoothed over by tweaking the custom judder and blur settings. We’d suggest you delve into the picture settings, pick ‘Standard’ mode, and then fine-tune the options to really get the 49Q7C looking its best. Detail levels are high whether you’re watching 4K or 1080p content. From rusty metal and motes of dust floating in a room to skin tones and textures of clothes and furniture – the 49Q7C tries its best to coax out as much nuance as possible in its well-balanced picture. Sometimes, however, the colours are just a tad overdone. A too-perfect blue sky, traffic lights glowing red, unsubtle blocks of bright green leaves – there are times when the colours look inconsistent. This happens scene-by-scene, too, and can be distracting. The 49Q7C may deliver an appealing contrast thanks to its brightness, but blacks aren’t particularly solid-looking. Toning down the backlight to achieve a more substantial darkness only dims the dazzling brightness we like so much about this 49in set. And while we’re not expecting inky, pitch black levels as seen on LG’s OLED65E7V, the Samsung’s greying blacks don’t entirely convey the space scenes in Star Trek and Star Wars films. Even Sony’s 2017 sets, such as the KD-49XE9005, manage to deliver darker, if not subtler, blacks. On the plus side, the curved screen isn’t as pronounced as previous years, and viewing angles are certainly better than we’ve previously seen on LCD screens. Whether you’re streaming Stranger Things on Netflix or watching Antiques Roadshow, the colours don’t tail off as drastically when seated off-centre. That’s a tick for Samsung’s QLED aspirations. Drop down to DVDs or terrestrial TV, and the Samsung’s vivid and detailed character remains. HD channels are pin-sharp and bright, and even early Top Gear episodes are fine to watch in the lower resolution. When it comes to sound, Samsung hasn’t tried to do anything fancy like vibrate the panel or add a soundbar to the TV. The 49Q7C sounds fairly clear and is easy to listen to when it comes to dialogue-heavy shows. The speakers (powered by 40W of amplification) aren’t thin or harsh, but they don’t compare to the kind of body, dynamics and detail you get with a good soundbar or 5.1 speaker package. We’d definitely recommend investing in a good sound system to go with your premium 4K TV. The QE49Q7C itself is a sleek set. The near-zero bezel means the 49in 4K HDR screen reaches the very edges of the TV’s frame. The elegant metal stand is easy to attach and should fit on to most TV stands. Where Samsung gets it right is in the TV’s ease of use. Everything is designed to be neat and tidy, from the separate One Connect box, which keeps your sources and connections out of sight, to the ultra-thin cable that connects the box to the back of the TV. The remote control has been given a sleek makeover, too. The new One Remote is similar to last year’s smart remote, but flat and silver. The TV responds instantly and smoothly to every command. The slim wand may not have a multitude of buttons on it, but it’s easy to get to grips with and becomes second nature after a few minutes. Voice commands, on the other hand, are still hit and miss. We found it either registered words too slowly (even when accurate) or simply didn’t work at all. Pressing the home button on the remote brings up Samsung’s streamlined smart hub. The row of apps that pop up from the bottom of the screen is easy to navigate, and the whole interface and EPG works seamlessly. It doesn’t take long to switch sources or skip to live TV, or fire up Netflix and continue watching from where you left off – especially when you can customise the order of the apps for quicker access. Netflix and Amazon Prime Video apps come installed in the QE49Q7C, with 4K and HDR content working straight from the start. While the built-in wi-fi works perfectly fine, we’d recommend going down the wired ethernet route for greater stability. You also get a selection of catch-up TV apps – BBC iPlayer, ITV Hub – as well as YouTube, Spotify and Google Play Store. On the connections side, Samsung keeps things sensible with four HDMI inputs (all compatible with 4K and HDR sources), an optical input, three USB ports, and Freeview HD and Freesat HD tuners. It’s a surprisingly mixed bag for Samsung – and more importantly, its first QLED - of 2017. The superb level of subtle detail and crispness are the real highlights of the 49Q7C. But it’s not a perfect set. The blacks aren’t as deep as we’d like, the colours don’t always look natural and motion can be tricky to optimise. As the parade of five-star ratings can attest, it’s been a long time since we’ve had a less-than-rounded Samsung TV. But it’s the price that really gets in the way of that fifth star. £2200 is a lot to pay for a 49in TV. 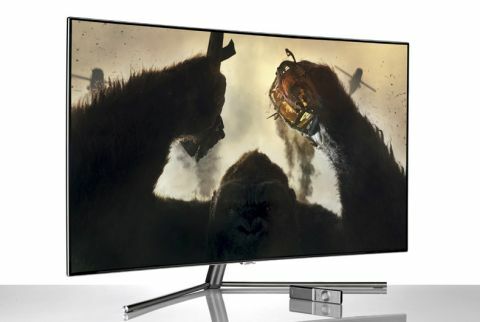 In comparison, last year’s Samsung 49in screen – the Award-winning UE49KS8000 – cost £1400. This year’s Sony KD-49XE9005 felt pricey enough at £1500, and despite its many virtues, the Samsung 49Q7C isn’t £700 better than the Sony rival. Samsung’s QLEDs may be positioned as premium sets above the rest of its 4K TV range, but we’ve not been blown away by the QE49Q7C. Not enough to justify that high price anyway.